Orange cones along the narrow one-way canal of Virginia Street during ongoing construction. South Virginia Street in Reno is undergoing one of the most significant projects in its history, an $80 million re-vamp that will impact parking, traffic and aesthetics. For several months, Midtown has been a messy construction zone. KUNR student reporter Wyatt Daane checked in with local business owners to see how they’re doing. Depending on the day, Midtown is usually a sea of orange cones and single-file cars driving along the narrow one-way canal of Virginia Street. Just off of Virginia Street, on Center, Holey Schmidt Donuts is serving its morning stream of donut lovers. Holy Schmidt Donuts has had to scale back on employees during this heavy construction period in the area. Holey Schmidt offers a wide variety of colorfully constructed donuts topped with everything from Fruit Loops to marshmallows to gummy worms. I spoke to Galen Schmidt, the owner of the shop who says the construction has taken its toll on his business. “We’ve reduced our staff down to a smaller level,” Schmidt said. Only a couple months after the construction started, they were forced to let team members go. However with construction moving down Virginia and away from their front door, business is improving. “In general, business has been coming back stronger. We saw a nice boost when the construction kind of held up,” Schmidt said. Just two blocks down at College Cyclery bicycle shop, owner Randy Collins says business hasn’t been negatively impacted. “I’ve been in business in this location for over 45 years; it’s actually fine,” Collins said. Collins told me that changes to the corridor have been needed for a long time. “I’ve been dealing with this for 20 years, so I’ve put in proposals to the city. We’re after a better street; basically, [we] want wide sidewalks, want trees, want walkable space areas in the Midtown area," Collins said. Tattoo artist Nikki Costaloupes says the project is having a surprising effect. 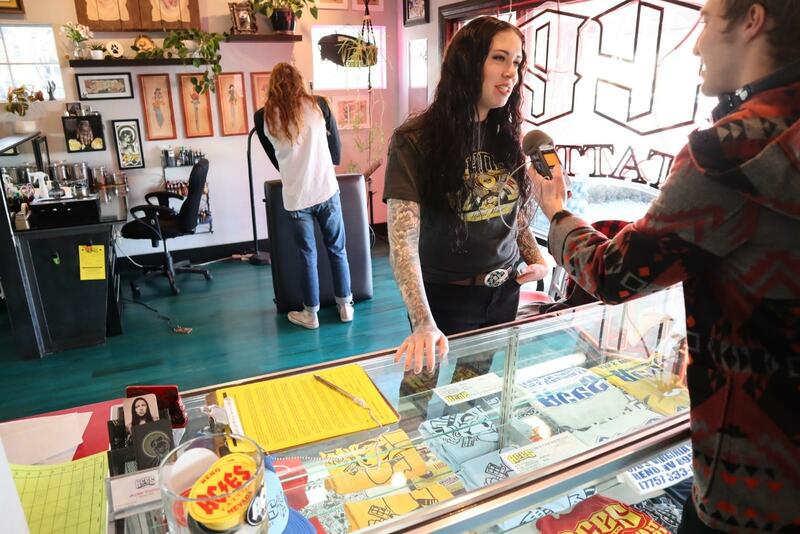 KUNR’s Wyatt Daane talking to tattoo artist Nikki Costaloupes at Aces Tattoo Parlor, who says business is doing well and the construction in Midtown Reno has actually provided additional parking for customers. Next door to Aces, a restaurant named Sup is packed for the lunchtime hour, serving hot bowls of soup to hungry customers. Diego Hernandez is having lunch. Often, the construction and the deluge of orange cones have kept him away from the area, and he wonders about the impact on tourists. "So, before I’d be kind of, like, fine just walking around here, but then it’s, like, kind of an issue with the cars going one way, and I went to drive down here and I realized how much of a nightmare it actually is,” Hernandez said. Lauren Ball is a spokesperson for the Regional Transportation Commission, or RTC, in charge of the Virginia Street Bus RAPID Extension Project. “We really want to encourage the community to not be scared of the cones. You know, it’s just a few cones, there’s plenty of parking. You can still walk down there. We know it looks scary and intimidating at first, but once you’ve navigated it, it’s fairly easy," Ball said. “We hope that people continue to patronize Midtown businesses and, in fact, we have heard from a lot of business owners that because of the parking we’ve been able to add within the construction zone, that their business has actually increased in certain spots." According to Ball, the second phase of the construction plan will make safety improvements and allow people to get in and out with ease. “Right now, crews are working on upgrading aging utilities and installing new utilities underground. If you walk down Virginia street, you’ll see a lot of overhead utilities; those will all be underground. That will improve the way the street works as well as the aging infrastructure,” Ball said. Virginia is one of the oldest streets in Reno, established in 1860, and the MidTown District houses about 250 businesses. The roadway improvements are slated to wrap up next year. Wyatt Daane is an alumnus of our Reno Youth Radio program who is now attending Columbia College Hollywood. For more information about the construction project in MidTown Reno, visit the Virginia Street Bus RAPID Extension Project. The Regional Transportation Commission of Washoe County (RTC) and Sierra Nevada Construction (SNC) are working to lower the impact businesses are seeing due to the renovation of midtown. KUNR contributor Kaleb Roedel of the Northern Nevada Business View has the details. In recent years, the Regional Transportation Commission, or RTC, has held numerous public meetings about redesigning portions of Virginia Street in Reno's MidTown District. Our reporter Bob Conrad of ThisisReno.com has the latest update. Virginia Street in MidTown is constrained by the roadway’s width and the need for ADA-accessible sidewalks, which has prompted plans to eliminate a center turn lane in favor of wider sidewalks. If Reno Were A Coffee, What Kind Would It Be? From time to time, KUNR likes to highlight some of the work being done by our community partners. That includes Niche Podcast, which profiles people in Reno with unique passions and hobbies, like Joe Marino, who owns a local coffee shop in MidTown. Contributor David Calvert stopped by the shop to learn more about Joe's business and his story. Marino owns Blue Whale Coffee Company in MidTown Reno, one of many small, local coffee shops popping up in the city.